No matter what industry you’re in – if you ever deal with automation, you understand that it has a lot of moving parts (and that’s not exactly a pun). 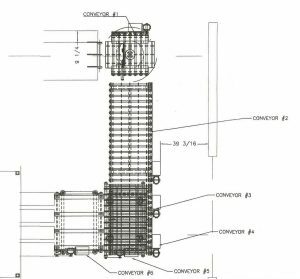 The moving parts you find in an automation system run the gamut from feeders and conveyors, to diverters, stackers, and everything in-between. But what really matters are the “parts” that influence an automation system without ever actually being a part in it – like the space it exists in and the characteristics of the product it’s built to accommodate. For our team at Wrabacon, this is what makes the difference between simple automation and creative automation. Consider for example the challenge posed by one customer in the glass converting industry. With a fragile product in 4 different sizes, a small amount of space to work with and strict timing parameters to accommodate – creative automation is exactly what they needed. Transfer four different size glass sheets from an existing screen printing machine to an existing oven infeed, allowing inks to cure on the glass sheeting. What is a transfer system? A transfer system is a safe, reliable, efficient system that transfers products from one step in the process to the next with little to no human interaction. The client produces screen prints on 4 different sizes of glass sheeting. The entire process took place in a 16 x 15-foot production area. Before creative automation, the process was slow, unpredictable, and antiquated. It required 2 employees to maintain glass alignment on the system and the need to maintain the proper gap between the sheets prior to the transfer of the sheets into the curing oven. It also relied on outdated parts, software, and controls that prevented the business from scaling with demand. Wrabacon’s task was to introduce a more modern, efficient, and effective system that improves efficiency and control, while operating within the existing room layout, with less manpower. 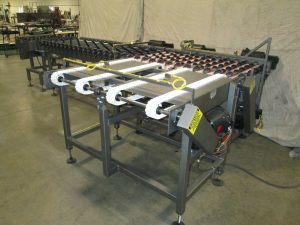 Step 1: The glass sheets exit the screen printing machine single file and transfer onto a 90-degree rotating conveyor. Step 2: The sheets transfer downstream on conveyor 2 to the pop up transfer zone. Step 3: The glass sheets enter the pop up zone which is made up of conveyors 3, 4 and 5. There are two pop up sections, one for each glass sheet. The first sheet travels over the first pop up zone to the second zone. When sensed, the pop up extends upward, lifting the sheet off the rollers. Step 4: The next sheet enters the first pop up zone and when sensed, is lifted off the rollers. Step 5: When both sheets are positioned, the conveyor belts start and transfer the sheets side by side onto conveyor 6. 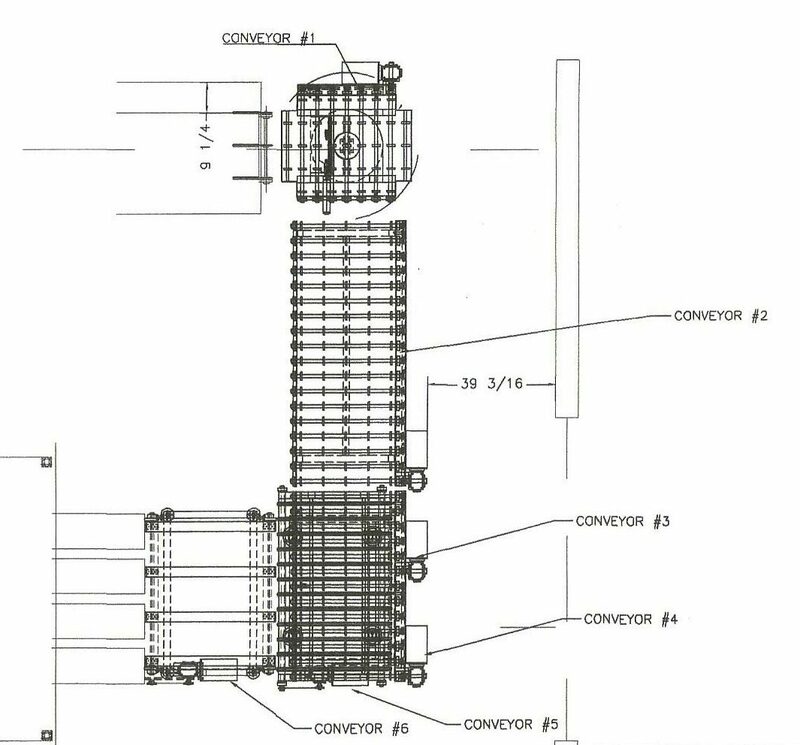 This conveyor brings the sheets to the oven infeed where they are transferred for downstream processing. The area where the transfer occurs has an approximate temperature of 80 degrees Fahrenheit. Step 6: We connected conveyor 6 to the existing oven variable speed drive. Using a 0 – 10 VDC signal, conveyor 6 follows the linear belt speed of the oven to allow for the proper gap between the trailing edge of the first sheet of glass and the leading edge of the second sheet of glass. The resulting system for our client was a completely custom solution, that allows the customer to complete one full sheet in 18 seconds. This has allowed the customer to drastically increase their output, provide more accurate lead-times, and grow at a faster rate. Have questions about how creative automation can make a difference for your business or industry? Wrabacon is the authority.